Here is the list of the hotels near Saint-Laurent-l'Abbaye. Book your hotel near Saint-Laurent-l'Abbaye today, Monday 13 May for the best price, reservation and cancellation free of charge thanks to our partner Booking.com, leader in on-line hotels reservation. Below here is the list the 50 closest hotels of Saint-Laurent-l'Abbaye, sortable according your criteria. You will find the position of these accommodations on the Saint-Laurent-l'Abbaye hotels map. Guest accommodation Pouilly-sur-Loire Preferred hotel ! Chalet la Noisetiere Armalou is situated in Pouilly-sur-Loire and offers free bikes, a tennis court and a garden. This chalet provides a terrace. This chalet is fitted with 2 bedrooms, a kitchen with a dishwasher and a oven, a flat-screen TV, a seating area and 1 bathroom with a shower. A continental breakfast is available every morning at the property. Staff at the chalet are available to provide information at the 24-hour front desk. Chalet la Noisetiere Armalou offers a children's playground. There is a shared lounge at this property and guests can go fishing nearby. Nevers is 40 km from the accommodation, while Sainte-Marie is 46 km from the property. Bed and Breakfast Pouilly-sur-Loire Preferred hotel ! Set in Pouilly-sur-Loire, Armalou provides accommodation with free WiFi and flat-screen TV. The units provide views of the garden and come with a washing machine, a fully equipped kitchen, and a private bathroom with free toiletries. Some units are air conditioned and include a terrace and/or a balcony, as well as a seating area. Guests at the bed and breakfast can enjoy a continental breakfast. Armalou offers a barbecue. Guests at the accommodation can enjoy table tennis on site, or go cycling or hiking in the surroundings. Nevers is 40 km from Armalou, while Sainte-Marie is 46 km away. Featuring accommodation with a terrace, Marielu is situated in Pouilly-sur-Loire. The accommodation has free WiFi. This holiday home comes with a kitchen, a seating area, and a TV. The holiday home also provides guests with 1 bathroom with a shower and a washing machine. Nevers is 39 km from the holiday home, while Sainte-Marie is 46 km from the property. Located in Cosne Cours sur Loire, 11 km from Sancerre, Hotel Ibis Budget Cosne Sur Loire provides views of the Sancerre and Chavignol vineyards. Free WiFi is provided throughout the property. Vending machines are available on site. At the hotel, every room comes with a desk, a flat-screen TV and a private bathroom. The units include a wardrobe. A buffet breakfast is served each morning at the property, at a surcharge. Guests at Hotel Ibis Budget will be able to enjoy activities in and around Cosne Cours sur Loire, like cycling. Guédelon Castle is 33.5 km from Hotel Ibis Budget Cosne Sur Loire. Located in Pouilly-sur-Loire in the Burgundy region, Gîte des Chaumiennes is a 2-star property boasting free WiFi. The property has river views. The holiday home is equipped with a flat-screen TV, a seating area, a kitchen with a dishwasher, and 1 bathroom. Gîte des Chaumiennes offers a barbecue. Guests at the accommodation can enjoy cycling and hiking nearby, or make the most of the garden. Nevers is 38 km from Gîte des Chaumiennes, while Sainte-Marie is 45 km from the property. Le Coq Hardi is located on the banks of the Loire River, in the countryside just outside Pouilly-sur-Loire. Guestrooms have en suite facilities and free Wi-Fi. The Coq hardi serves a mixture of gourmet and traditional cuisine in its restaurant overlooking the Loire River. Guests can enjoy many outdoor activities in the surrounding area. The Pavillion di Milieu de Loire is nearby and Bourges is an hour’s drive away. Guest accommodation Saint-Père Preferred hotel ! Situated 15 km from Sancerre Vineyards, this guest house features a garden with a terrace, free Wi-Fi and free private parking on site. Cosne-sur-Loire Train Station, shops and restaurants is 2 km away. Opening onto the garden, each room at L’Orée des Vignes features a wardrobe, coffee and tea making facilities, and a private bathroom with free toiletries. A continental breakfast with homemade jam and yogurt is included in the price. The owners can prepare an evening meal using local products upon request at least 24 hours in advance. Paris is 180 km away and the A77 motorway is 2 km from L'Orée des Vignes. Set in Pouilly-sur-Loire, La Pouillyzotte provides accommodation with an outdoor pool, free WiFi, a garden and a terrace. There is a fully equipped private bathroom with shower and a hair dryer. A continental breakfast can be enjoyed at the property. Nevers is 37 km from the bed and breakfast, while Sainte-Marie is 43 km away. Le Vieux Relais has a terrace and a bar in Cosne Cours sur Loire. Free WiFi is available. The units in the hotel are equipped with a flat-screen TV. All rooms come with a private bathroom with a shower and free toiletries. All guest rooms include a desk. Sancerre is 14 km from Le Vieux Relais, while Gien is 45 km from the property. Featuring free bikes and free WiFi, Le Prieuré Saint Agnan is set in Cosne Cours sur Loire. The property features a seasonal outdoor swimming pool, as well as a garden. Guests can make use of a terrace. At the guest house, the rooms include a wardrobe, a flat-screen TV and a private bathroom. Le Prieuré Saint Agnan features certain rooms with river views, and all rooms come with a coffee machine. A continental breakfast is available daily at the property. Cycling and hiking are among the activities that guests of the accommodation can find nearby. Sancerre is 14 km from Le Prieuré Saint Agnan, while Gien is 45 km away. Boasting free bikes and terrace, as well as a restaurant, Le Saint Christophe is set in Cosne Cours sur Loire. This 2-star hotel features free WiFi and a bar. The accommodation features a concierge service, and luggage storage for guests. At the hotel, every room includes a desk. Each room includes a private bathroom with a shower. All rooms have a wardrobe. Breakfast is available every morning, and includes continental and vegetarian options. Sancerre is 15 km from Le Saint Christophe. Offering free WiFi at the reception and a restaurant, Camping de l'île is set in Cosne Cours sur Loire, 50 km from Nevers. Sancerre is 11 km away. Free private parking is available on site. There is a seating and/or dining area in some units. There is also a kitchen, equipped with a microwave, fridge and stovetop. Blankets and pillows are provided. You can play table tennis at the property, and the area is popular for fishing and canoeing. Gien is 38 km from Camping de l'île. Set on an 800 m² garden, Hotel La Buissonnière is in the centre of Bannay and 9 km from Sancerre. It offers free Wi-Fi access, a terrace with outdoor furniture and rooms with a private terrace. Rooms and suites are individually decorated and feature a wardrobe and a private bathroom with a hairdryer and free toiletries. Some rooms include a flat-screen TV and are suitable for guests with reduced mobility. A buffet breakfast can be enjoyed every morning at Hotel La Buissonnnière. Traditional and regional cuisine can be prepared by the hosts upon request at least 24 hours in advance and it is possible every day of the week except Wednesday. This hotel is 6 km from Cosne-Cours-sur-Loire Train Station and 7 km from the A77 motorway. Free public parking is available nearby. This charming 3-star hotel is on the banks of the Loire River and offers 11 personalised rooms complete with air conditioning, free Wi-Fi access and flat-screen TV. Hotel De La Loire boasts a privileged location with an 18-hole golf course, mini golf and swimming pool (open in the summer only) less than one kilometre away. You will also find 4 restaurants about 2 minutes walking from the hotel. This Logis is located on the banks of the Loire, in central France. Situated on a Nature Reserve it offers air-conditioned guest rooms with TV, balcony and free Wi-Fi. The Relais De Pouilly restaurant serves regional cuisine and a seasonal menu. In summer, guests can enjoy meals on the hotel terrace. The Pouilly vineyard is situated just 2km from the Logis Le Relais De Pouilly and guests can enjoy visits to its cellars. Guests of the Relais De Pouilly can also visit the medieval town of La Charité and enjoy hiking and cycling in the surrounding countryside. Boasting air-conditioned accommodation with a terrace, la ferme aux kangourous is set in Le Magny. Housed in a building dating from 1976, the farm stay is in an area where guests can engage in activities such as cycling and fishing. Situated on the ground floor, this farm stay is equipped with with 3 bedrooms, a well-equipped kitchen with a dishwasher and an oven, a living room, and a flat-screen TV. The farm stay also features 1 bathroom with a shower. The farm stay offers a barbecue. Guests can also relax in the garden. Nevers is 42 km from la ferme aux kangourous. Chez Jeannette is located in Saint-Satur. This holiday home has a garden, barbecue facilities and free WiFi. The holiday home includes 3 bedrooms and a kitchen with a dishwasher and an oven. A flat-screen TV is provided. The holiday home offers a terrace. Guests can also relax in the shared lounge area. Bourges is 50 km from Chez Jeannette, while Nevers is 50 km from the property. Set in a renovated country house, La Petite Montoise is located among the Burgundy vineyards, a 15-minute drive from Bertranges Forest. Stays with a hunting theme, including accompanied hunting trips in the forest are offered. The property proposes self-catering apartments with free Wi-Fi and access to the south-facing garden. Featuring exposed wooden beams, the apartments both have a flat-screen TV with DVD player and a bathroom with either a bath or shower. Linen and towels are provided free of charge. You can prepare homemade meals in the kitchen using the microwave, oven and fridge. It also includes a coffee machine and after meals, guests can play table tennis for free. With free private parking on site, this property is a 15-minute drive from the town of Donzy and the medieval castle in Guedelon is 45 minutes away by car. Situated in Saint-Satur, Le Verger Fleuri has a garden and a terrace. The property features a bar, as well as a restaurant serving French cuisine. Free WiFi is available. At the hotel, every room is fitted with a desk. At Le Verger Fleuri the rooms have a wardrobe and a flat-screen TV. Guests can take part in various activities in the surroundings, including cycling and fishing. Bourges is 49 km from the accommodation, while Sancerre is 3.1 km away. Set in Saint-Satur, l'abri du viaduc provides accommodation with free WiFi, seating area and flat-screen TV. There is a fully equipped shared bathroom with shower and a hair dryer. A continental breakfast is served daily at the property. The restaurant at the bed and breakfast specialises in French cuisine. L'abri du viaduc offers a terrace. If you would like to discover the area, cycling and hiking are possible in the surroundings and the property can arrange a bicycle rental service. Bourges is 48 km from the accommodation, while Sancerre is 2.7 km from the property. 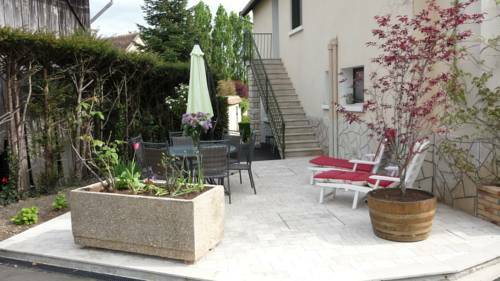 Located in Donzy, in the Burgundy region, this charming hotel features a restaurant with a terrace area. Logis Le Grand Monarque offers elegant accommodation. Guest rooms at Logis Le Grand Monarque are equipped with a private bathroom, flat-screen TV and a telephone. Guests can enjoy regional cuisine and local wines in the restaurant, and relax with a drink at the bar. Every morning a buffet breakfast is served. Activties and sights nearby include hiking, fishing, visits to La Motte Josserand Castle and Notre Dame du Pré Abbey. Bicycle rental is available onsite. Logis is 17 km from Cosnes-sur-Loire train station and 50km from Nevers Airport. Free Private parking is available onsite. Located in Cosne-Cours-sur-Loire, on a 1.5-hectare estate, Hotel des Gatines offers a garden and terrace. Nevers is a 40-minute drive from the property. All rooms are decorated individually and they feature both a flat-screen TV and a wardrobe. The en suite bathroom is complete with free toiletries. A continental breakfast serving cakes and homemade jams is available each morning. Additional features include a shared lounge, a fireplace in the dining room and free Wi-Fi access. La Charité-sur-Loire is a 25-minute drive away and free private parking is possible on site. Located 50 meters from Sancerre city centre, this detached holiday home features a terrace with views of the vineyards and the river. A garden with barbecue is also featured. Free private parking is provided on site. This house dates back from the 18th century, it offers an equipped kitchen and a dining area on the ground floor. On the fist floor, you will find a bedroom with en suite facilities. There is a second bedroom on the top floor. Free WiFi is provided at la Maison du Guetteur. Towels and bed linen are offered. Restaurants and shops can be found within a walking distance. Pouilly-sur-Loire is 15 km from the property, while Bourges is 46 km from La Maison du Guetteur. The area is popular for cycling and hiking. Located in the heart of Sancerre, Brit Hôtel Le Clos Saint Martin is an ideal base for discovering the area’s famous vineyards. It offers a patio with a fountain and free Wi-Fi access. Guest rooms at Brit Hôtel Le Clos Saint Martin are spacious, air-conditioned and have a flat-screen TV. Each room has a private bathroom that is fitted with a shower. Guests can enjoy a full breakfast buffet at the Brit Hôtel Le Clos Saint Martin before setting out into the surrounding Loire Valley. You can also enjoy regional wines in the bar lounge. Located 200 metres from Tower of the Fiefs in Sancerre, Residence Le Silex offers accommodation with a kitchen. Guests staying at this holiday home have access to free WiFi. Composed of 2 bedrooms and 2 bathrooms with a bath and a shower, this holiday home features a flat-screen TV. Set in Sancerre, the hotel Le Panoramic welcomes you right amid a vineyard and boasts an unrivalled view of the vines. Totally renovated, all guest rooms are air-conditioned and equipped with satellite television and Wi-Fi Internet access. Each room offers a unique view of the hillsides of Sancerre, a region famous for its wonderful wines. Le Panoramic’s suites also offer a comfort of high quality. Their lounge area allows you to relax or invite your friends in an intimate and friendly setting. Take time to enjoy a sumptuous breakfast while admiring the sunrise over the hillsides of Sancerre, then discover this charming area. Le Cep en Sancerrois is a B&B located in Sancerre. It offers suites with garden views and a communal wellness centre with a sauna and massages. Free WiFi access is available throughout the property. This renovated house dates back from 1750 and has respected the tradition of historical monuments. All of the suites here will provide you with a private bathroom fitted with a shower or bath and free toiletries. A continental breakfast is served every day. Guests can also request a homemade meal or relax on the terrace and the communal garden. The property offers free parking. Sancerre Golf Course is 6 km away and Bourges is located 46 km from this B&B. Located in the heart of Sancerre, Hotel du Rempart offers a terrace, restaurant and free Wi-Fi access throughout. Guests can visit the famous Sancerre Vineyards and Bourges is just a 45-minute drive away. All rooms feature a flat-screen TV, a telephone and a wardrobe, while some rooms have a view of the vineyard. The en suite bathroom includes free toiletries. A buffet breakfast is available each morning at an extra charge. Both buffet and à la carte options are possible in the on-site restaurant. Additional features include daily newspapers and free public parking at the hotel. Cosne-sur-Loire is 10 km away and Nevers is a 45-minute drive from Hotel du Rempart. Set 1 km from Tower of the Fiefs in Sancerre, Les Gites Douillets de Sancerre offers accommodation with a kitchen. It has garden views and free WiFi. The holiday home has 3 bedrooms and 2 bathrooms with a shower. A flat-screen TV is provided. The holiday home offers a continental or buffet breakfast. Speaking English and French at the 24-hour front desk, staff are ready to help around the clock. Les Gites Douillets de Sancerre offers a barbecue. The accommodation features a garden and sun terrace. Featuring free WiFi and a restaurant, Hôtel Le Verseau offers pet-friendly accommodation in Boulleret. The hotel has a sun terrace and views of the garden, and guests can enjoy a meal at the restaurant or a drink at the bar. A bicycle shed is available. Each room is fitted with a TV with satellite channels. All rooms have a private bathroom equipped with a shower. For your comfort, you will find free toiletries and a hair dryer. Sancerre is 11 km from Hôtel Le Verseau, while Gien is 35 km away. The Loire river is a 3-minute walk from the property. Set in Myennes, Detente a la campagne provides a garden and free WiFi. Boasting a shared lounge, this property also provides guests with a sun terrace. Guests can enjoy garden views. At the guest house, the rooms include a desk, a flat-screen TV and a private bathroom. Guest rooms at Detente a la campagne are fitted with a seating area. Hiking is among the activities that guests can enjoy near the accommodation. Sancerre is 23 km from Detente a la campagne, while Gien is 45 km from the property. Featuring garden views, La Cuvellerie in Narcy features accommodation and free bikes. Free WiFi is provided. Some units have a seating area and/or a terrace. The bed and breakfast offers a barbecue. Guests at La Cuvellerie can enjoy table tennis on site, or hiking in the surroundings. Nevers is 32 km from the accommodation. Located 200 metres from hiking trails and a 25-minute walk from the riverbank and Val de Loire nature reserve, this motel offers a terrace and free parking. Set in a garden, it proposes rooms with free Wi-Fi. With a private entrance each room has a TV. A kettle with tea and coffee making facilities is also available upon request. The en suite bathroom has free toiletries. A continental breakfast can be ordered and taken in your room while you read the newspapers. You can also relax with a drink in the bar at Motel Les Brousailles. A 5-minute drive from exit 27 of the A77 motorway, the motel is 3 km from Charité sur Loire SNCF Train Station. Magny Cours motor racing circuit is 30 km away. Nevers is a 25-minute drive. Located in Varennes-lès-Narcy, La Charité sur Loire offers accommodation with a private pool and private parking. Guests staying at this villa have access to a fully equipped kitchen. The villa has a satellite TV and 4 bedrooms. The villa also comes with 2 bathrooms. Nevers is 31 km from the villa, while Sainte-Marie is 35 km from the property. Located in Verdigny in the Centre region, Annexe Gite Des Vignes has a terrace. It features free WiFi and barbecue facilities. The holiday home has 2 bedrooms, a flat-screen TV and a fully equipped kitchen that provides guests with an oven, a microwave, a washing machine, a toaster and a fridge. The property also has 1 bathroom with a shower. Guests at the holiday home can enjoy a continental breakfast. Round-the-clock assistance is available at the reception. There is a shared lounge at this property and guests can go hiking nearby. Sancerre is 6 km from Annexe Gite Des Vignes. This hotel featuring a gourmet restaurant and bistro is ideal for discovering Sancerres gastronomy. La Côte des Monts Damnés offers bright and spacious rooms equipped with free Wi-Fi internet access. This charming hotel is the ideal place for discovering Chavignol cheeses and Sancerre wines. Both the bistro and the restaurant serve only the best local produce. La Cote des Monts Damnés is surrounded by wonderful countryside. Explore the forests, lakes, and vineyards stretching down to the River Loire. With free bikes and a garden, Moulin de Janlard is located in Nannay and features free WiFi. A continental breakfast is served daily at the property. If you would like to discover the area, fishing is possible in the surroundings. Nevers is 38 km from the country house, while Sainte-Marie is 36 km from the property. Situated in Nannay, Domaine de Guichy offers accommodation with free WiFi. Some units also have a kitchen equipped with a dishwasher, an oven, and a microwave. Nevers is 38 km from the holiday home, while Sainte-Marie is 36 km from the property. Surrounded by vineyards, L'Esterille is just 4 km from the centre of Sancerre and a 30-minute drive from Sologne. It offers an on-site bar and restaurant, which serves traditional dishes with local wines. The rooms at L'Esterille are decorated in neutral tones and include free Wi-Fi access. Each one also has an LCD TV, ironing facilities and an en suite bathroom with free toiletries. Breakfast can be enjoyed under the wooden beams in the restaurant or in the comfort of guest rooms. During the summer, you may also choose to dine or relax on the terrace. Free private parking is available on site and the A77 motorway is 12 km from the property. Sancerrois Golf Course is a 10-minute drive away and Bourges is 40 km from the hotel. Charme et délicatesses in Fez provides accommodation with free bikes and a garden. All rooms feature a kitchen and a private bathroom. All rooms are fitted with a terrace with pool views. All rooms at the guest house are equipped with a seating area. Guest rooms in Charme et délicatesses are fitted with a flat-screen TV and free toiletries. A continental breakfast is served daily at the property. The accommodation offers an outdoor pool. Guests at Charme et délicatesses will be able to enjoy activities in and around Fez, like hiking. Bourges is 45 km from the guest house. Situated in the medieval city of La Charité-sur-Loire, this self-catering studio is located in a 15th century building and features wall stones, free Wi-Fi and a private, furnished courtyard. The supermarket is 500 metres and the A77 motorway is 1 km away. The living room has a fireplace, sofa bed, 2 armchairs, an LCD TV with French and international channels, and DVDs. A washing machine and ironing facilities are also available. Studio Bardin also includes a fully equipped kitchen with a dishwasher, oven, electric kettle, coffee machine and kitchenware. Shops, restaurants and bars are located within a walking distance. Sancerre and its vineyards are 24 km away and Bourges is 50 km from Studio Bardin. Appartement Meneau is located in the centre of the medieval city of La Charité-sur-Loire, just a 1-minute walk from the church. It offers a furnished terrace, a selection of board games and free Wi-Fi. The apartment is made up of 1 bedroom, a fully equipped kitchen and a living room with a DVD player. A washing machine, ironing facilities and cleaning products are provided for your convenience. Local supermarkets can be found 500 metres from the property and the train station is 450 metres away. Other local attractions include the Sancerre vineyards, 24 km away. Set in an 18th century building in Charité sur Loire, the Mille et une Feuilles hotel is dedicated to French writers. Located on the St Jacques de Compostela pilgrimage route, it offers free Wi-Fi internet access. Mille et une Feuilles offers comfortable rooms equipped with a TV, a fan and an en suite bathroom with free toiletries. The hotel’s restaurant is decorated with portraits of famous writers and serves creative dishes made with local produce. Guests at the Mille et une Feuilles are just 5 minutes from the railway station, the historic town centre and its neighbourhood booksellers. Located a 3-minute walk from La Charité-sur-Loire Church and 500 metres from the train station, Appartement Bénédictin is a two-bedroom apartment with 2 terraces. Guests can enjoy the view of the church stained glass. The accommodation includes 2 bathrooms with hairdryer, a flat-screen, satellite TV and a DVD player. You can also use free Wi-Fi access on site. The kitchen on site provides a coffee machine, an electric kettle and a toaster. Restaurants and grocers can be found within a 5-minute walk. The property is situated 40 km from Bourges Airport and 1 km from the A77 motorway. There is a free public car park at a location nearby. A 2-level apartment set in the medieval city of La-Charité-Sur-Loire, Appartement Lucarne offers self-catering accommodation, free Wi-Fi, a view of the cathedral, and free public parking at a location nearby. A stone spiral staircase leads to the apartment. It features 2 bedrooms, 2 bathrooms with showers, a living room and a dining area. The bedrooms have individual air conditioning and heating. The living room features stone walls and exposed beams. It also includes a table for up to 8 people, DVDs, books, 2 leather armchairs, a sofa and a sofa bed. The roof-top terrace has a table and 4 chairs and it offers a view of the cathedral. The kitchen includes a refrigerator, electric stove and oven, coffee machine, toaster and microwave. Kitchenware and a washing machine are also provided. Located in the centre of the medieval town of La Charité-sur-Loire, Appartement Sanet is a self-catering apartment with a terrace and town views. It is equipped with free Wi-Fi and is 450 metres from the train station. With a private entrance and parquet floors, Appartement Sanet features a living room with a sofa bed, flat-screen TV with cable channels and DVD player. The bathroom is fitted with a shower and hairdryer. You can prepare meals using the apartment’s kitchen, which is equipped with stove, oven, fridge and microwave. An electric kettle, coffee machine and kitchenware are also provided for your convenience. Shops and restaurants can be found 500 metres from the apartment. Other facilities at Appartement Sanet include an iron, ironing facilities, a washing machine and cleaning products. Free public parking is possible near the property and Sancerre is 24 km away. Hotel le Bon Laboureur is located in La Charité, on an island bordered by the River Loire and a 5-minute walk from the town centre. Set in a former coaching inn which dates from the early 19th century, the hotel features a garden. Each room here will provide you with a TV. Featuring a bath or shower, private bathroom also comes with a hairdryer and free toiletries. Free Wi-Fi access is available throughout. A continental breakfast with French pastries, bread, hot drink and orange juice is served daily. Other meals can be purchased at the reception. An array of activities can be enjoyed on site or in the surroundings, including fishing and hiking. There is a cycling path in the area and a large, public car park is available 50 metres away. Free public parking is available on site. Maison Vauyon is a semi-detached holiday home situated in La Charité-sur-Loire in the Burgundy Region and is 48 km from Bourges. The unit is 23 km from Nevers. Free WiFi is offered throughout the property. There is a dining area and a gourmet kitchen complete with a dishwasher and an oven. Towels and bed linen are provided at Maison Vauyon. Other facilities at Maison Vauyon include a sun terrace. Washing machine and dryer are also featured. Bike hire is available in the village and the area is popular for wine tasting, horse riding and cycling. Sancerre is 22 km away while Pouilly-sur-Loire is 14 km far from the property. An array of activities are offered in the area, such as fishing, canoeing and hiking. Located in Couloutre, Maison Frankrijk offers accommodation with access to a garden. Some units also have a kitchen equipped with a fridge and a stovetop. A continental breakfast is available every morning at the holiday home. Maison Frankrijk offers a terrace. Sancerre is 37 km from the accommodation, while Cosne-Cours-sur-Loire is 27 km away. Momella House is situated in Colméry and offers a garden and a terrace. The property was built in 19th century, and has accommodation with free WiFi. The holiday home includes 3 bedrooms, a living room, and 1 bathroom with a shower. There is a seating area, a dining area and a kitchen complete with an oven and a toaster. Fishing and hiking can be enjoyed nearby. Sainte-Marie is 36 km from the holiday home, while Sancerre is 38 km away. Below here is the hotels map of Saint-Laurent-l'Abbaye. Names and details of Saint-Laurent-l'Abbaye hotels can be shown on the map clicking on the prices icons.